Following years of full-time employment in sales and marketing, Mike Lawrence bought a self-help book and his life changed forever. 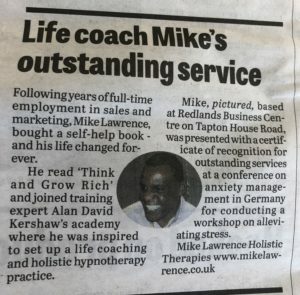 He read Think and Grow Rich’ and joining expert Alan David Kershaw’s academy where he was inspired to set up a life coaching and holistic hypnotherapy practice. Mike, based at Redlands Business Centre on Tapton House Road, was presented with a certificate of recognition for outstanding services at a conference on anxiety management in Germany for conducting a workshop on alleviating stress.